Drill small nicks in the clove of garlic (which should then be removed) and put it in a bowl where you will add 3 tablespoons water, 2 1 of Apple Cider vinegar, shoyu, the Rosemary and a pinch of dried oregano (for marinating, you can also use other herbs to your liking, for example: thyme, Sage, etc.). Let stand for at least 10-15 minutes. 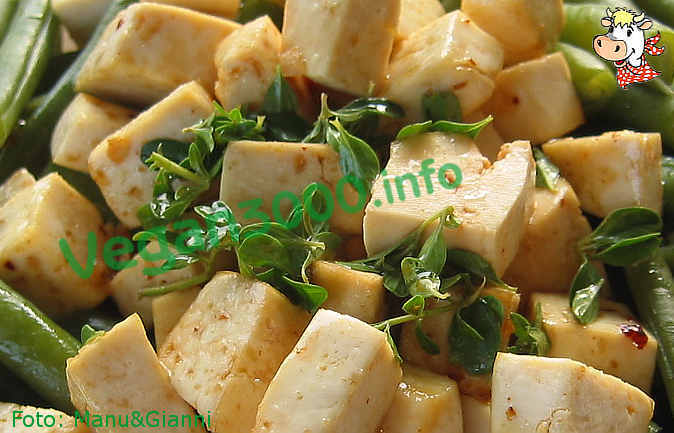 Meanwhile cut the tofu into slices about half a cm thick and place them at the bottom of a baking sheet. Cover with the marinade and let stand for at least 30 minutes (the longer the marinade and more tofu is flavorful). Before baking, remove a portion of the marinade, including the garlic-that at this point you uncheck it permanently--and the Rosemary, hence be hooked some leaflets you leave on the tofu. Keep part of marinating, you can remove it with a spoon, for use at the end of cooking. Bake for about 20-25 minutes at 180° c.
When cooked add the portion of marinade you saved. This dish should be served warm: Optionally you can also reheat a few minutes before serving. Cottura in padella invece che al forno? Come mi verrà?